We can get this working the way we want it to with just CSS. What we need are vertical columns in which to place the images. That way the images will stack on top of each other, and the height issue is moot. We could wrap equal numbers of images in floated divs, but that's not very easy to keep balanced. The trick is going to be to use Masonry CSS, where the vertical columns are made through the CSS3 property column-count. Yeah, literally, the thing where you can set text in narrow columns automatically. So as long as the parent with the multiple columns is as wide as the browser window (default) and the column-gap is 0, we got it made in the shade. 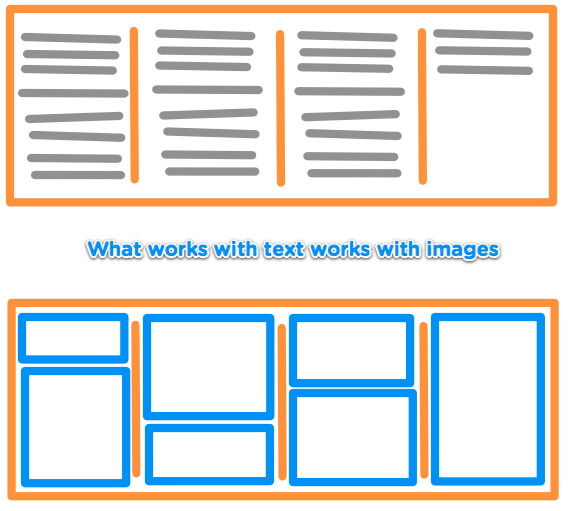 By setting the width of the image to 100%, they will take up exactly the width of one column. But what about when the browser window starts getting narrow? 5 columns might be great for a very large browser window but too many for a smaller browser window (5 images side-by-side might get too narrow). We can fix the problem super easily by having media queries test the browser width and adjust the number of columns accordingly. 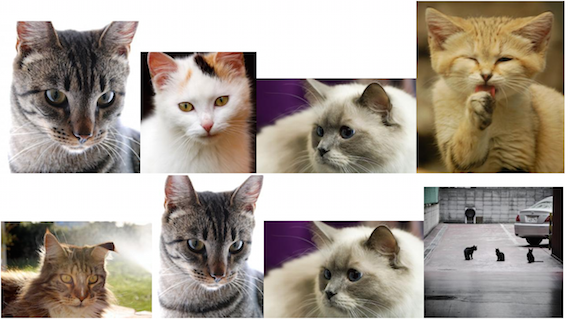 See the Pen Seamless Responsive Photo Grid by CSS-Tricks (@css-tricks) on CodePen. What is cool about this technique to me is that since it's pure CSS, everything happens very smooth and fast. You can resize your browser all around and watch things resize and move very quickly. So as far as browser support, it's pretty good, except IE, where it only works in 10+. Otherwise: Firefox 3.6+, Opera 11.1+, Safari 4+, Chrome 10+. Might even be a bit deeper than that. You might just skip a fallback because whatever it's not that bad it just has some white gaps. Or you might use the Modernizr/YepNope combo (Modernizr can test for it as csscolumns) to load up jQuery Masonry and see what you can do with that. Or you could test for it and roll your own JS which counts the images and splits them up into equal groups and wraps floated divs around them. Whatever floats your boat. Hm… any way to fix the bottom though? Great article! There’s definitely a “Masonry” trend going around the web, especially for images galleries. But this is a pure CSS solution. This is cool, but I would think, in most cases, you would want your images to load left to right and not top to bottom in columns…. I guess you could sort your images so they would load that way, but that seems like a lot of work unless it’s a static list. If anyone can do it, then you can earn another yellow star! Very nice article, thanks for the tip. Interesting concept for portfolio sites. too bad css columns don’t allow for “column-min-width” and “column-max-width.” that’d be “made in the shade” with no media queries. Nice article. Pretty nifty idea. This will certainly inspire my next image wall. Have to correct on compatibility though. At least in my Firefox 3.6.18 it does not work. Images are scaled 100% of the browser window. Seems as if the columns are not used. Cool Chris, thanks for this tut. Was discussing this exact format with some development guys the other day, they wanted to minimize any jquery etc for a design they are converting to cms so if we still need to go down this route I will definitely show them this all CSS technique. What does the ‘rand(200, 400)’ do in the php? It doesn’t seem to be a height, but part of the image link. rand(200,400) is giving a random number between 200 and 400 and printing(echoing) it in the height portion of the url. It is part of the URL. The service (placedog) takes arguments from the url and returns dog pictures with the dimensions given. Hey Chris! I wonder why you’ve stopped using rel="(CSS, HTML, PHP etc)"
I was just lazy, I fixed these. Thanks! Although, then it wouldn’t be necessary, for example, to include ‘PHP:’ before the code and then PHP being written inside the ‘code-box’ again. I suggested using rel again because I thought then you’d not have to say ‘PHP:’ or ‘Here’s the CSS:’ before the code-box. Hi Chris, nice article and a very funky technique. If I’m not mistaken, there’s a small typo inside your media queries.—shouldn’t #people be #photos? Yes it should :-) Just spend way too much time debugging everything in the download. Wow this is so straight forward and useful. Cheers. How about the idea of a wordpress template that would post thumbnailed images like this at full-screen as short cuts to blog posts? Yet one box would remain in a fixed location as a logo? That’s actually a great idea. I can see this being very useful, especially for portfolio type WordPress sites. There could text that appears when an image is hovered to describe the post briefly as well. So many different things could be done with this. I agree Darryl. My main idea on this is an easy place to mix pix messages (via phone), as well as other photos, designs, graphics and posts. I’ll see what I can do about making one. Not sure how I’m going to get the functions to loop yet keep a single box in place. Great idea…got the gears turning on that one! Your solution is so close in IE7…great tutorial! Thanks. one thing to note is on the img style, if you add any positioning such as relative or whatever, safari has a weird bug which will break the css3 column layout. AWSUM!! 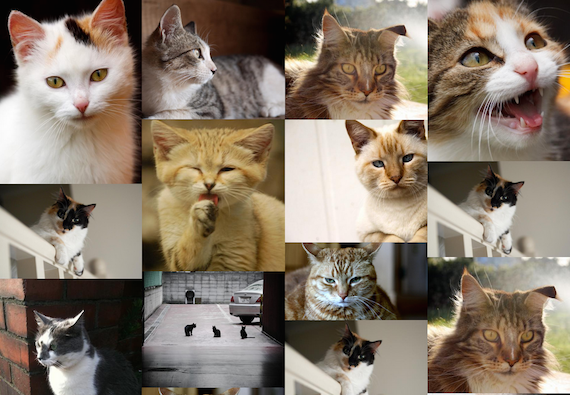 Wall to wall kittens by power of pure CSS. The day just can’t get better! ;-) Good work. Another idea for non-CSS fallback would be to use the attribute ‘align=”absmiddle”‘ on the img tags. This would line up the image centers horizontally. Nice. It’s useful CSS . Very Nice! I will have to give this one a try, much nicer (and cleaner) than one (not by you) I have used in the past. Thanks! That’s an excellent use for the “Masonry” style! And to see you use my column-count technique to do it is about the greatest confirmation that it was a good idea that I could have hoped for. P.S. : +1 on the “make this a WordPress plugin” idea. Great Article, gotta love the Ghost Busters Quote put in there. Nifty. It’s nice to see CSS techniques getting applied to solve problems that aren’t always obvious. I’m a big fan of keeping HTML markup super simple, and CSS3 allows us to do some fantastic stuff without cluttering the markup. Wow! I really love this site. You all offer some good information. I love your use of kittens too. I am a Tucson web designer, so this is all super useful for me. Keep up the good work. I’ll be checking in regularly to get more tips and hints. Thanks. That’s a really nice solution to an age-old problem. Very useful. Instead of doing CSS3, couldn’t you have left them inline-block and done vertical-align top? And you could’ve removed the white space between them by setting font-size to 0? I don’t want to be beating a dead horse, but the download still has the mistake of the section id=’people’ instead of section id=’photos’. Great tut! I have been looking for this for a long time! And pure CSS! Hey Chris, love this idea. I’m trying to implement a version of this technique on my site but I think I’m running into a few issues with how webkit handles columns? I have 6 images / 6 columns at high resolutions and 6 images / 3 columns at lower resolutions. It behaves as expected in Firefox but not in Chrome or Safari. When you return to the higher resolutions it remains at 3 columns? The same happened to me. It’s webkit issue, it handles css3 stuff differently usually. I’m trying to find a solution to make it look better, but ineffectually yet… Have you solved this problem? As far as I saw, some kind of bug also appears, if you declare line-height, and works pretty fine without this. Sort of. @Janos – I basically gave up trying to find a fix for this using just CSS and ended up using jQuery Masonry instead. What a neat technique, thanks! I’m having a pesky problem with adding some captions though, and I’m wondering if anyone can help. Here’s the test page: http://souchi.com/pages/celebrity3 As you can see, the text that ends up at the bottom of the longest column won’t stay at the bottom of that column. It wants to wrap to the top of the next column. Anyone know the solution for getting that caption to stick with the image? Cheers. What is lost when you change the column gap from 0 to something larger? 1px, 2px? I love the effect, but would love the option of a little spacing between images. Tried 1px gap in Firefox and looks okay. Does it affect mobile/responsiveness? Thanks! Nice technique. Placedog.com appears to have expired and been bought by a speculator so the dog images are not showing in the demo. Maybe it’s time to go all-out cats? Fixed with all cats for now, thanks! As usual when visiting your website i’am impressed of the capabilities of a simple css propriety. You are really awesome, I love your site !! Thank you for sharing so interesting knowledge and tricks!